Doncaster Knights boss Clive Griffiths will officially return to work at Castle Park on Monday for the first time since heart surgery. “I’ve been in contact with the rest of the coaching staff, who have done a job fantastic job and worked manfully in my absence, over the last few weeks, and I’ve been over to Castle Park on a few occasions but I’m officially back as from Monday,” he said yesterday. But he stressed that he wouldn’t be back in a ‘tracksuit role’ in the near future. “I’m feeling better and hopefully I’ll get back to where I was within the next six months. But I’ve had a bit of a scare, a shot across the bows if you like, and I’ve got to heed the warning. “We’ve had to change the (coaching) structure and we’ve brought Phil Larder out of retirement to help out with the defensive coaching and to be my voice on the training field. “You can’t get much better than Phil who, I’ve worked with at international level, and I’m lucky to have friends like that to call upon. He’ll continue to help out at the club until he feels that he has had enough. “Having said that, I think I have rekindled his enthusiasm for coaching and if it has to be that way for the future then that is the way it has to be and I’ll be working more as a director role and spending less time on the training field taking the training sessions. 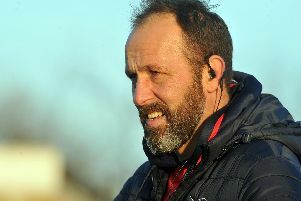 “As director of rugby I’ll still be making the decisions, though the other coaching staff will still have their opinions and they’ll have the freedom to try things as was the case when I’ve been an assistant coach in the past. Centre Will Owen, who played his first game of the season last weekend when playing 20 minutes for Doncaster Phoenix, will have a longer run-out with the struggling Midlands Premier Division side today. “If he comes through the game without any problems then he’ll come into contention for our opening Championship Cup group game against Coventry next weekend,” said Griffiths.